1.Sugar Lip Treatment I love love love this stuff, I can't explain how great this lip treatments are I have only tried the mini ones but I would for sure get the full size. I would recommend this to anyone. 2. Julep Nail Therapy I didn't dislike or like this product I haven't notice any chances in my nails when I used it. This is a product that I wouldn't buy again unless it came in a set with other polishes. 3. Neutrogena Makeup Remover these cloths are great at removing your makeup in a few wipes the cloth in formulated with cucumber and aloe. 4. MAC Gently Off Eye & Lip Remover this is great at removing makeup, it's also great to clean up any mistakes with a q tip instead of wasting a makeup remover wipes to clean up a little mistake. The only thing is that this product did trouble my eyes, I have sensitive eyes and I felt like this was not gentle enough for them or it could be because of the oil that is in this makeup remover the was the problem for my eyes, I'm not to sure. I would choose makeup wipes over a liquid remover on a daily basics. But this remover was great at getting off lipstick and the stain that can sometimes be left behind. 5. Revlon Lip Butter Sugar Plum was my favorite lip colour that I own and it's sad to see that it's all done now but I plan on trying other shade from Revlon Lip Butter collection as I love the formula of this product. I have a detailed review on Revlon Lip Butters click here. 6. Dove Gosleeveless was a total waste of my money this product did not last long at all. It just failed in my book and I switched back to my regular Dove deodorant, I haven't even finished this product there is still some left but it's just not a good product. I hate having to waste what is left over by throwing it away but this was just a total waste. I would not recommend the Gosleeveless collection however their visiblysmooth collection is great and I would recommend that line to people. 7. Maybelline Illegal Length Mascara at first I did not like this mascara because it has fiber extensions which I didn't like but once the fibers were all finished from the mascara I started to like this mascara. However I will not be repurchasing this product because I didn't like it over all. You can check out my review of this mascara here. 8. Revlon Lash Adhesive is great there is no waiting time for the glue to get tacky before you apply your lashes and I like that I can apply the lash glue with a brush better than using lash adhesive that comes in a tube. This lash adhesive dries clear the only problem is that after a why'll some brush hairs spiked out from the brush. Also when cleaning off extra glue on the rim of the tube from the brush the lid would get hard to close I guess from dried glue on the rim of the tube. 9. Sephora Blotting Papers come with100 sheets in a pack which is great, they are a good size compared to the ones I currently have now which is NYX the Sephora blotting sheets are better in size and have more in one pack, but they do cost 10 dollars which is more then NYX. 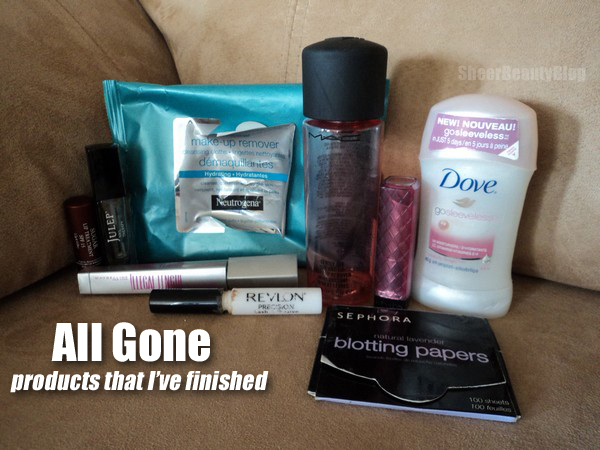 What products have you finished lately? 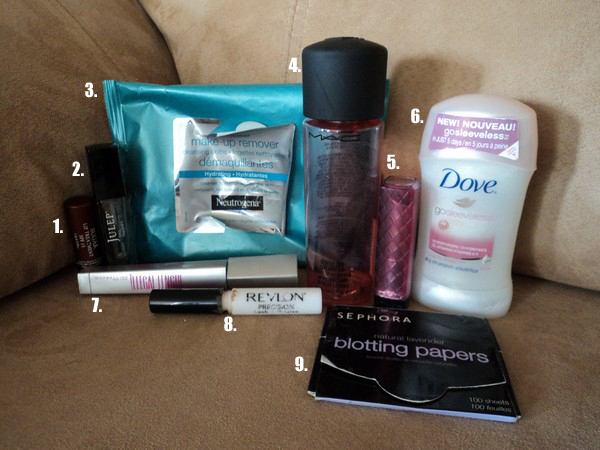 I like the Neutrogena wipes a lot..I always struggle with finding ones that take off really all my makeup! Those work great! The sugar plum lip butter is my favorite too! Are you going to repurchase that shade? I also like berry smoothie because I feel like they are pretty similar.